She immediately started shouting about Sarkozy. “He’s reforming the pension, but he doesn’t care about the people”, Yvonne said. “He’s got money.” Private aeroplanes, his rich friend's private yachts. Yvonne retired when she turned sixty. “Believe me”, she said, “I made a nice profit there”. How old could she possibly be? 84 she told me. 84? My god, I’d be happy to be in that shape at the age of sixty. She looked pretty good, she was well dressed, her hair was nicely done, freshly coloured, with lipstick on her lips, her eyebrows painted, and no wrinkles, or almost none. “Do you think I look good:”, she asked fishing for a little compliment. “Of course”, I replied, and I didn't have to lie. “I’m a parisienne”, she told me, “I’m a coquette”. Sure she is. I love these old ladies with what the French call allure. It’s an attitude. It’s not about refusing to grow old. It’s about growing old honourably. 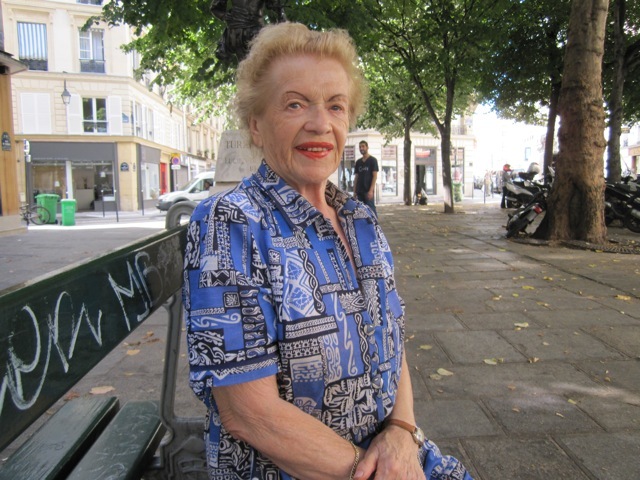 Yvonne Goud, that’s her name – like the English word “good”, she says – has been living in Paris since 1954. She was born in the Auvergne, the real countryside, but she always felt like a city dweller. She still has her accent from the southern-central region of France but it's mixed up with Parisian argot, the language of the locals. At the beginning she worked in the house of the great-grandson of Louis Pasteur. She met all the academiciens there, the famous and important members of the legendary Académie Française. Even Farah Pahlavi of Iran. After that she became telephonist in the then new district of La Défense. All the stories she’s tells me sound like they happened yesterday. But she can’t remember what year her husband died. Yvonne is a healer. She shows me how her hand heats up the parts of the body she is massaging. It’s quite impressive. And to stay in shape, she walks a lot. She takes the bus to left bank of Paris then walks back home. “Le fauteuil est un cerceuil”, she tells me. Which means : “The armchair is a coffin.” It doesn’t rhyme in English. But it’s still true.